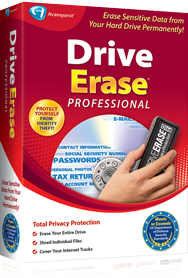 Fix-It Drive Erase Pro™ privacy software completely and permanently erases data from your hard drive so that you can sell or donate your computer with confidence. You'll never have to worry about your confidential data falling into the wrong hands with this privacy protection software. With Fix-It Drive Erase Pro you can choose to delete all of the data on your hard drive or just shred selected files - easily, securely and permanently. And it does it all to the highest standards, complying with the most stringent U.S. Department of Defense security requirements for drive erase privacy software.